This was the first scorpion species scientific described (by Linnaeus himself), and the name Scorpio means scorpion. The specific name, maurus means dark or obscure. The species is sometimes known a the Largeclawed Scorpion or Israeli Gold Scorpion. Africa (Algeria, Egypt, Libya, Mauritania, Morocco, Senegal, Tunisia), Asia (Iraq, Iran, Israel, Jordan, Kuwait, Lebanon, Quatar, Saudi Arabia, Syria, Turkey, Yemen). This species is often found in desert habitats, but can also be found in dry forrests. It is a burrowing species, which inhabits different types of substrats (burrowing must be possible). The burrows are often 20 - 70 cm deep (the bottom of the borrow is usually enlarged). This species lives in very warm habitats, but will experience winter temperatures down to 10-15 C in some areas (the scorpion will "hibernate" in the burrow during winter). Mildly venomous, but a painful sting. Harmless for healthy humans. This aggressive species will often use claws for defense, and not use the stinger. LD50 values are reported to be 9.37 - inactive (mg/kg) and 141.6 - inactive (mg/kg). M.R. Warburg and R. Elias (1999). Differences in the female reproductive system of Scorpio maurus fuscus H.& E. (Scorpionidae) between two populations inhabiting different regions in northern Israel. Israel Journal of Zoology, Vol. 45(2), pp. 225-229. Rutin, J. (1996) The burrowing activity of scorpions (Scorpio maurus palmatus) and their potential contribution to the erosion of Hamra soils in Karkur, central Israel. Geomorphology, 15(2), pp. 159-168. M. R. Warburg & Rivka Elias (1998). The reproductive potential and strategy of Scorpio maurus fuscus (Scorpiones: Scorpionidae): anatomical clues in the ovariuterus. Journal of Zoology, vol. 246(1), pp. 29-37. M. Shachak & S. Brand (1983). The relationship between sit and wait foraging strategy and dispersal in the desert scorpion, Scorpio maurus palmatus. Oecologia, vol. 60, pp. 371-377. Scott Stockwells Scorpion de Jour. This species is 6-8 cm long, and the different subspecies (19 subspecies are described in Fet et al., 2000) are varying in colors. Most have a yellow to redbrown color (the tip of the claws are usually dark redbrown), but some subspecies (like S. maurus fuscus) are dark brown/blackish in color. The different subspecies can be seperated by the color variations, but not always. It is possible that some of the subspecies represent true species, but a thorough revision of the genus is necessary before any conclusion can be drawn. 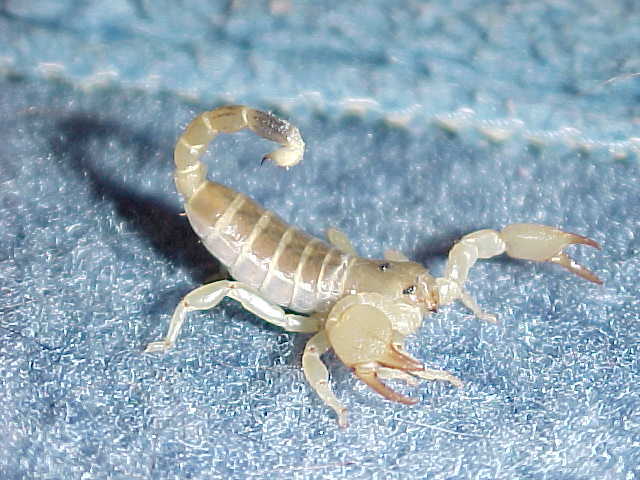 This species is often found in colonies, but each scorpion has it's own burrow.. This species is kept in captivity. Breeding seems diffcult.